Huge tracts of the inland Costa del Sol were destroyed in a series of forest fires this weekend. The first fire started late on Thursday 30th of August and spread quickly across the tinder-dry countryside. 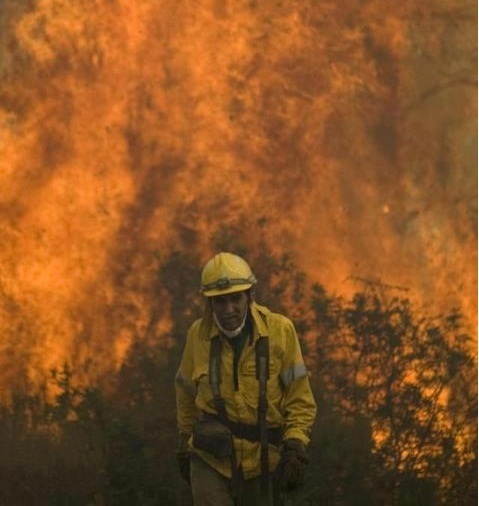 For the next two days and nights hundreds of firefighters supported by even more volunteers and soldiers from the Spanish Emergency Support units fought to get the fires under control in what turned into a huge logistical exercise. The fire started on early Thursday evening. Within minutes it was burning furiously and despite the prompt arrival of the emergency services, tongues of fire were soon covering a wide area. The firefighters had to evacuate several farms, fincas and hamlets as they strove to stop the fires spreading. It was immediately evident that this was a major incident and reinforcements were quickly on the scene from all the local forces. Despite the best efforts, the fires quickly raged out of control and for two whole days the firefighters wrestled to extinguish them. Sadly, no less than 5,000 residents had to be evacuated from the towns and villages inland from Fuengirola in the east to Marbella in the west. Sports centres were commandeered at short notice as Cruz Roja launched an extraordinary support project to feed, water and shelter whole villages. The prestigious Marbella Congress Centre which is more used to hosting exhibitions and conferences became the central point of assistance in the city. The irony of this humanitarian action being required on the very day that the new stringent health regulations were introduced was not lost on many of the media. I can confirm that nobody was refused support because of any irregularities in their paperwork. This was not the moment to make political points and, indeed, the whole effort was superbly coordinated in a very slick manner. Over 600 firefighters and 28 aircraft were involved from all over the coast and beyond. Eventually, some semblance of normality was returned but in total 224 homes has been affected and some 7,775 hectares burnt out. Tragically one elderly man also lost his life and there were many injuries - broken bones, burns and, of course, smoke inhalation. This has been a particularly bad summer in Spain for such fires with major incidents in Catalonia, Valencia, Toledo, Zaragoza, Madrid, the Canaries and others all devastating communities and destroying agricultural land. In Andalucía almost 8000 hectares were lost and as I write I hear that 700 more hectares have been destroyed in Toledo this weekend. Mercifully, the death tolls have been relatively low. Whilst any loss of life is tragic, the fact that the fatality and injury total is so low is a testament to the efforts and professionalism of the emergency services and the commitment and enthusiasm of the volunteers. Respect to all of them.